Four nominations for Sainsbury’s magazine and one for Savills’ INSIGHTS: World Cities Review 2012. Seven has been shortlisted at the Digital Magazine Awards for the second year running, this time with four nominations for Sainsbury’s magazine and one for Savills’ INSIGHTS: World Cities Review 2012. The only customer magazine to have won the PPA Customer magazine of the year three times, Sainsbury’s magazine is a finalist in the following categories: Food and Drink Magazine of the Year; Magazine Cover of the Year; Magazine Advertisement of the Year and Editor of the Year. Under Editor, Helena Lang’s direction, Sainsbury’s magazine recently moved into the digital publishing arena. October 2012 saw the launch of the magazine’s first interactive issue, using Aurasma-activated augmented reality [AR] technology. The popular magazine also became available as a digital edition across tablet devices. The new editorial approach enabled the team at Seven to include a cover video, featuring an introduction from Helena followed by split-screen coverage of interactive content from the magazine, including step-by-step recipes and extra elements to enhance the print content. Advertisers were able to have a slice of the action too. A finalist in the Magazine Advertisement of the Year category, John West’s interactive print campaign, featured in the same issue, brought to life Fisherman ‘Sam’. Using Aurasma, an interactive video of Sam allowed readers to “view the story behind every can”. Readers were then able to tap to access the John West website to find out exactly where their can of tuna came from. October also saw the launch of Sainsbury’s magazine’s ‘Kitchen Secrets’ blog, a showcase of the most popular content from the magazine, mixed with regular news reviews tips and competitions. Sainsbury’s magazine isn’t the only print-to-digital publication produced by Seven to have seen success at the awards. Savills’ INSIGHTS: World Cities Review 2012 is also a finalist in the Specialist Magazine of the Year category. A key player in some of the planet’s most high-profile and iconic property transactions, the bi-annual print edition of World Cities Review has become a flagship publication for Savills, highlighting the research and insight expertise that underpins the company and supports its business decisions. In a sector dominated by property search and data-aggregating apps, Seven created an app driven by content, developing a better way of handling the volume of quality research and data that could be readily consumed by Savills’ clients, both new and old. From short expert features and eye-catching statistics to personal opinion, Seven’s expert editorial team have ensured that content is based on one unifying idea – to give insight into the planet’s property future. The Digital Magazine Awards celebrates the best magazines, individuals and advertisers from the international digital publishing industry. Last year attracted entries from 31 countries, with awards received by entries from the US, UK, Germany, Holland and South Korea. 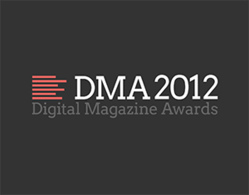 WIRED (UK) was announced as the Digital Magazine Awards 2011 Magazine of the Year. The final award winners will be announced at the Digital Magazine Awards 2012 interactive showcase on 6th December at the Proud Gallery, Camden, London. Seven is an award-winning Content Marketing agency making, managing and monetising print, video, digital, social and mobile content. Content that builds audiences, generates revenue and grows channels into valuable owned-media assets. Seven is an award-winning, multi-platform content marketing agency. Expert in creating intelligent, relevant and effective content across multiple channels, including magazines, websites, social media, interactive e-zines, video, iPhone and iPad apps. Clients of Seven include Aviva, Sainsbury’s, CIMA, Grant Thornton, Guardian Media Group, Lloyds Banking Group, New Look and English Heritage.